Robert Milton Schoch (born April 24, 1949) holds many degrees in formal education, and many, many more of research and discovery. Schoch received his BA in Anthropology and a BS in Geology from George Washington University in 1979. He was awarded MS and PhD degrees in both Geology and Geophysics from Yale University. Schoch's PhD dissertation, Systematics, Functional Morphology and Macroevolution of the Extinct Mammalian Order Taeniodonta, was published in 1986 by the Peabody Museum of Natural History. Dr. Schoch is currently a full-time faculty member at the College of General Studies at Boston University. Beginning at a very early age, Robert Schoch’s fascination with Ancient Egypt has shaped his research, and his life. Dr. Schoch is renowned for his open-minded and evidence-driven consolidations of of lost histories. New hypotheses have opened academic doorways that have been passed by for centuries. Subtly is an advantage Dr. Schoch holds over peer academics, historical critics, and even conventional Egyptologists. “15,000 to 11,000 years ago Earth experienced a series of climatic fluctuations. It had been extremely cold, with continental glaciers extending much further than they do today, but the climate started to warm. However, temperatures suddenly reverted back and there was a short cold spell, known as the Younger Dryas, before the final warming and the official end of the last ice age. 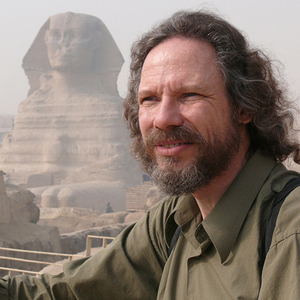 Dr. Schoch’s opinion, or hypothesis, on the origin of these catastrophic attacks on the Earth is also among others in the academic community, such as the late John Anthony West, who Schoch worked with to produce The Mystery of the Sphinx which introduced American viewers to the discovery that the Great Sphinx of Giza might be thousands of years older than its assumed date of 2500 BC. Narrated by Charlton Heston, the documentary provides evidence that the ancient Egyptians possessed scientific knowledge unknown to us and carried on the wisdom tradition of an earlier lost civilization. This work has become the hallmark of Dr. Schoch’s lifelong journey of literally uncovering hidden histories and finally putting at ease what he believes in his mind, and his heart. But, the journey is far from its end. Technological evidence suggests a void is present under the left paw of the Great Sphinx - meaning there is an unnatural space consistent with the shape of a large box. Schoch’s experience and research provokes the possibility of an ancient library of archives, though if such a space exists it is extremely likely it has been found in antiquity and probably raided. But, the very idea could be one of the greatest modern discoveries in Giza. Schoch has applied for permission with the Ministry of Antiquities to delicately excavate the area in hopes of finding the library. Here is the full article from his website, www.robertschoch.com. In the aforementioned article, Dr. Schoch also incorporates the viable supposition that if indeed the Great Sphinx is older that the pyramids of Giza, or at least the Great Pyramid, than it would be easier to assume that the mysterious human-like head could have been an alteration from the original “lioness”, as research has also suggested. This, in grave proportions, would be a revolutionary notion, and would go directly against the traditional Egyptology studies and proclamations about the history, age, and development of the entirety of Ancient Egypt. Dr. Robert Schoch’s timeless work has taken him through and around the world, going “where the evidence leads”. Schoch was recently a guest on the Joe Rogan Experience, on the PowerfulJRE YouTube channel. They discussed the background of Dr. Schoch’s work and the progress of his current studies, and his approach to bringing forward real evidence of false histories among colleagues, fellow academics, historians, and the reality itself that we have been taught. Watch the full interview here. Dr. Robert M. Schoch will be an honored presenter at The Portal To Ascension Conference in Irvine, CA October 5-7, 2018. Click below to see other speakers, get tickets, subscribe for the livestream, and more information!